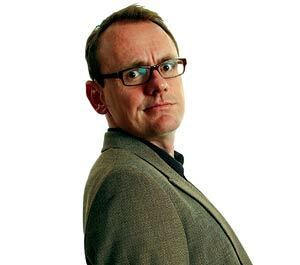 On Thursday April 8th 2010 I saw Sean Lock live at the Wolves Civic in Wolverhampton. His tour is called Lockipedia, and it is basically what Shaun knows about ‘stuff’. It has no real theme apart from what goes on in everyday life! No real dramatics as Shaun came out, a little grin and a funny walk to the middle of the stage, but nothing dramatic. The usual ‘hello how are we all tonight’ and then the jokes began. However, they wern’t that funny, average at best. 5 minutes into it he stops and says “so far the jokes have been ok haven’t they, not great, but the sort where you go ‘ar yeah he’s right you know'” (as Shaun nods and does this slightly high pitch voice), unfortunately I can’t do an impression via a text article! But it was very funny. And this was to become a recurring theme throughout the night. Brilliantly built-up using average jokes. Sean’s style is very much to keep hitting you with jokes, often you don’t even get the chance to stop laughing and he is half way through the next gag. This can mean the atmosphere struggles to build to its full potential, but he delivers it brilliantly and it feels like your job to catch up with a breath, because he isn’t going to stop. After the first hour though the break was welcomed as the awful Wolves Civic seats began to numb our bums! After a 15minute break Sean reappears with a little silver stand, which has a book on it, “time to play a game!”, this game is what he calls “Audience Battleships”. The silence descends as everyone waits in a slightly nervy state. It turns out Sean has a book full of gags (hence the Wikipedia/Lockipedia), for hundreds of different dictionary words. He then reads a seat number out and the member of the audience has to pick a letter and subject – to which Sean proceeds with his jokes. This was a welcome change to his non-stop pre-break routine. But did at times slow down too much when audience members didn’t respond. After a short while of Sean’s book we are back to the routine. Very much in the same style and non-stop format as before. I felt he definitely was at his strongest at this point, with his best jokes flowing. All highly observational comedy of course! As the night continued on I began to realise this man can talk forever! He perhaps could have gone on for hours more. A testament to the sheer amount of jokes Sean has is that during the night I only heard one gag from him that I’d heard before. Impressive considering the amount of times I have seen him on panel shows, interviews and of course Live At Apollo. And he didn’t doing his stand-up for 45 minutes, it was a full on 2 hours! Once again another comedian who is great value for money, at £15 a ticket not bad at all for an evening of laughs! Overall I would give the performance 8/10. It was perhaps a bit long, even the funniest comedians need to know when to stop and leave the audience wanting more. He could have cut some of the lesser gags out to achieve this. But nonetheless a thoroughly enjoyable night. Sean is on tour until November 2010 so take a look at your local area to see when he is near you! good summary i went that night and he had me in stitches at times. i think with sean theres a fine line between funny and him being a bit mental. I did struggle to follow him at times as well. You dont know what music he used in the interval do you? My foot was tapping all the way through.